We hope you enjoy our conversation with Mirko. How would you describe collectAI? 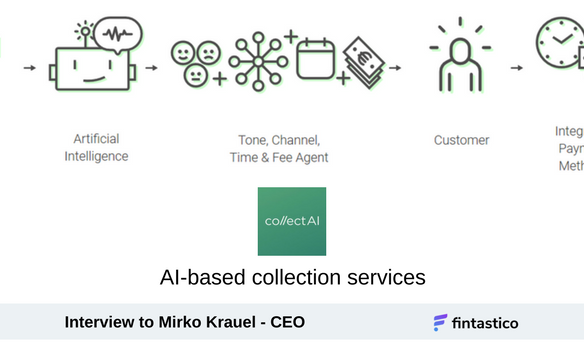 What is the value added of collectAI compared to a traditional account receivable software and what is the use of the Artificial Intelligence? collectAI is a financial technology company focusing on digitising receivable management end-to-end. With this, we tackle a topic tat has thus far mostly been neglected during cross-industrial digitisation. We offer services starting with the purchase of a product or service or the return debit note - depending on the industry we are speaking of. We digitise e-invoicing, dunning and debt collection on a modular basis. Our AI-driven technology is customer-centric, observing and continuously optimizing messages, timing and tone of voice. Our services are a win-win-situation for both, companies - our clients - and end consumers - their customers. This is also what differentiates us from traditional services. What drives us is the philosophy that a customer worth serving is a customer worth keeping. Due to outdated or manual processes on our clients' side we see that consumers aren't served well enough during the invoicing, dunning and debt collection processes. Very often the customer relationship gets damaged or breaks because the invoices of payment reminders are too aggressive. Focusing on the customer relationship and therefore the ultimate goal to increase customer retention, collectAI's technology is changing this situation. collectAI is focusing a lot on the Communication Channels and Payment Methods, can you elaborate on that and give us some examples? The old way of managing receivables is a linear progression: mostly manually handled you send a letter or an email to the customer in default. This letter is a standard letter without any individualisation. collectAI further digitises these processes, which is also drastically reducing costs for our clients. While doing so, our technology makes use of machine learning algorithms that are able to individualize the communication with every customer. Therefore, we individualize channel (email, whatsapp, text message, postal letter, etc. ), timing (early in the morning, in the evening) and the tone of voice (friendly, amusing, remindful, assertive). As a practical example this means that certain customer groups are more likely to respond at 9am in the morning rather than 9pm. Furthermore, we integrate payments in every communication step. A customer can pay directly online. Our algorithms measure its own effectiveness by using all relevant information and optimise the decision next time a customer communication is being sent out to a) a specific customer as well as b) customers whose profile is similar to the one customer. Questions the system might ask itself are for instance: "Did he open the email? ", "Did he go to the landing page? ", "Did he try to make payment? ", "Was the payment completed?" etc. This leads to a smart automated process that is fully individual and leads to the best response based on the information the algorithm has. How is the activation process working? How do you implement the integration with the legacy systems of your customers? Usually our integration works via a RESTful API. There are other options possible like direct integration into customer systems, but this is only very rarely. Furthermore, we support some ERP systems via a standard integration. Is the service mainly for corporations or can it be used by SMB as well? Yes, of course we are also working with small and medium businesses. In general, the system could be adapted to any business that handles account receivables, just that the smaller it is, the less cases you have. Based on your records, what are the industries that are mainly using collectAI today? At this points we serve banks, e-commerce platforms, digital publishing houses, insurances, utilities, P2Ps and other fintech companies. Is collectAI available all over Europe? Could it be used by Italian companies as well? Yes, in theory, we could also work with Italian companies. As we just launched our service in 2016, we have focused on the DACH and NORDICS region as well as UK for now. Pricing Plans: tell us something about it. To say this upfront: all our clients have much lower processing costs since starting off their collaboration with us. We work with a monthly minimum fee and a fee per claim depending on the numbers of payments. In your opinion, which of the European countries are the most active in the Fintech arena? The good with Europe is, that we don't have an extremely centralised Fintech industry like in the US. Europe has a lot of strong cities such as London and Berlin where you find notable and successful fintech companies. Nevertheless, you'll find further successful companies in Paris, Stockholm, Zurich and Amsterdam just to name a few.